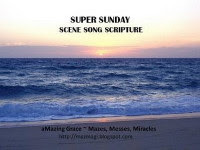 Blessings Jenny...with this Spirit filled song anointed by the beautiful voice of Kari Jobe...I know you have just blessed my SUPER SUNDAY and truly started my week with His power & grace! Thank you for your sweet words & visit but mostly for joining SUPER SUNDAY!!! Love this & praying as I write that He is MORE than enough & fills you with an abundant portion this week, for nothing is impossible for Him or you in & thru Him! His has more than enough power to heal all in Jesus Name!!! Urgent prayer requests on my blogs for a fellow blogger. What an amazingly powerful video! Thanks a ton for sharing this. I loved not only the powerful images, but also the wonderful, wonderful music. A great start to my week, like you said!